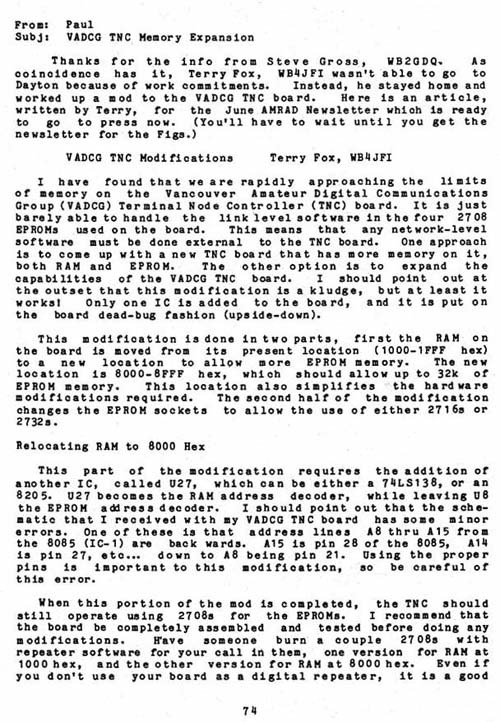 I have found that we are rapidly approaching the limits of memory on the Vancouver Amateur Digital Communications Group (VADCG) Terminal Node Controller (TNC) board. It is just barely able to handle the link level software in the four 2708 EPROMs used on the board. This means that any network-level software must be done external to the TNC board. One approach is to come up with a new TNC board that has more memory on it, both RAM and EPROM. The other option is to expand the capabilities of the VADCG TNC board. I should point out at the outset that this modification is a kludge, but at least it works! Only one IC is added to the board, and it is put on the board dead-bug fashion (upside-down). This modification is done in two parts, first the RAM on the board is moved from its present location (1000-lFFF hex) to a new location to allow more EPROM memory. The new 1ocationis 8000-8FFF hex, which should allow up to 32k of EPROM memory. This location also simplifies the hardware modifications required. The second half of the modification changes the EPROM sockets to allow the use of either 2716s or 2732s. This part of the modification requires the addition of another IC, called U27, which can be either a 74LS1 38, or an 8205. U27 becomes the RAM address decoder, while leaving U8 the EPROM address decoder. I should point out that the schematic that I received with my VADCG TNC board has some minor errors. One of these is that address lines A8 thru A15 from the 8085 (IC-1) are backwards. A15 is pin 28 of the 8085, A14 is pin 27, etc... down to A8 being pin 21. Using the proper pins is important to this modification, so be careful of this error.